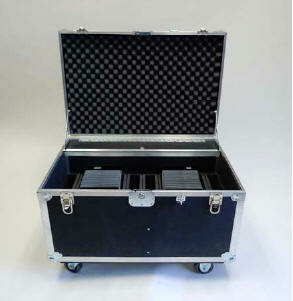 Our portable storage and security solutions offer efficient and affordable strategies for any tablet and mobile device deployment. These transport cases let you to bring your devices where they are needed, safely and securely (complete with charge and sync* capabilities). 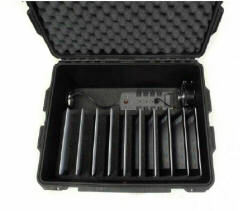 They are perfect for trade shows, travelling labs, training centers, conferences and shared facilities. 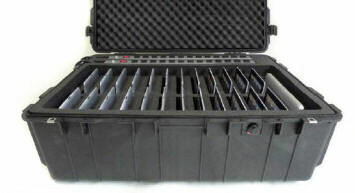 They are made in the same style as many durable equipment cases. Shipping customers use them for Dell Latitude and XPS, Lenovo, HP, Microsoft Surface, Samsung, Acer, and Asus tablets, iPads, as well as Kindles and Nooks. Different versions store and deliver 10, 16, 24 and 38 tablets (even when they are used in most protective cases) and a notebook host. Some provide power strips for charging; others use sync-and-charge universal USB hub connections. They have storage for cables and other equipment. Custom configurations are available. Our portable sync-and-charge solutions offer an efficient and affordable strategy. When and where they are needed, they allow you to bring sync capabilities to your tablets or bring your devices to a sync station that is an effective shared resource. 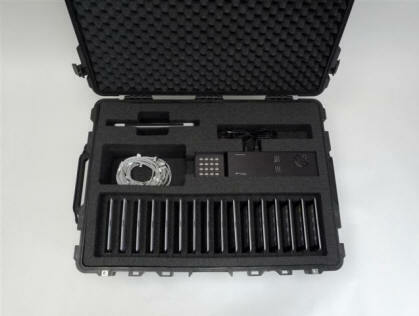 Our carry cases are perfect for classrooms, tech centers, libraries or service depots. 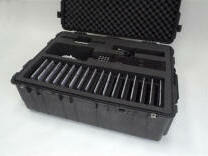 They can also be used when you are storing and charging mobile devices in an existing notebook cart. This can save you money (in some cases tens of thousands of dollars), improving management control and security and making the best use of scarce resources. If every room does not need its own, full-time sync station, this is a great way to leverage your tech resources. * Charge and sync capabilities are only for tablets that permit USB charging and USB data communications to a host.